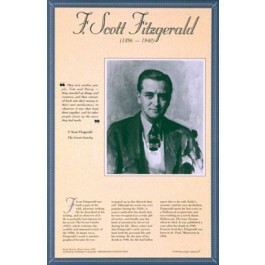 This unique educational poster of author F. Scott Fitzgerald features a striking artist's rendering of him, as well as a quote from "The Great Gatsby," and concise biographical text summarizing his life and career. 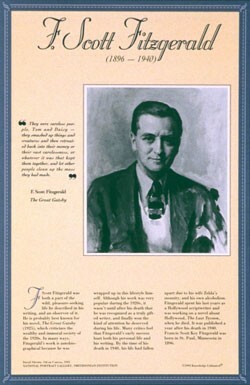 F. Scott Fitzgerald was both part of the pleasure-seeking and privileged life he wrote about, and an observer of it. His work was very popular during the 1920s, but it wasn't until after his death that he finally achieved critical acclaim. He died in 1940 at the age of 44. This poster is a great way to introduce students to this classic 20th century American author.